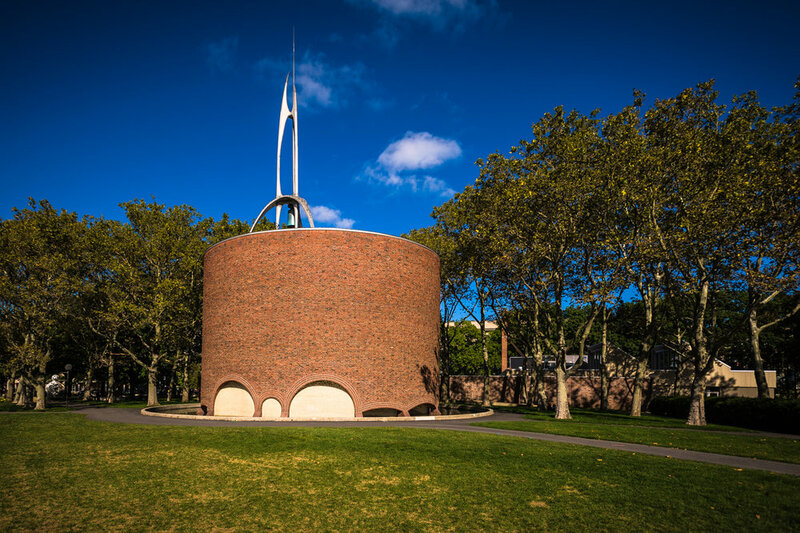 The MIT Chapel was designed by prominent architect Eero Saarinen as a brick cylinder that recalls Byzantine churches like San Vitale in Ravenna. Founded in 1861, the school did not have a chapel until 1955. Paired with Saarinen's famous Kresge Auditorium nearby, the chapel was designed to meet the religious and spiritual needs of everyone on the MIT campus. The interdenominational chapel, which holds just over 100 people, was intended for small services, individual meditation and prayer, while the large (4000 seat) Kresge Auditorium was built to accommodate community gatherings, musical events, and lectures that celebrate the human spirit through the arts and humanities. The chapel is entered through a stained glass walkway. 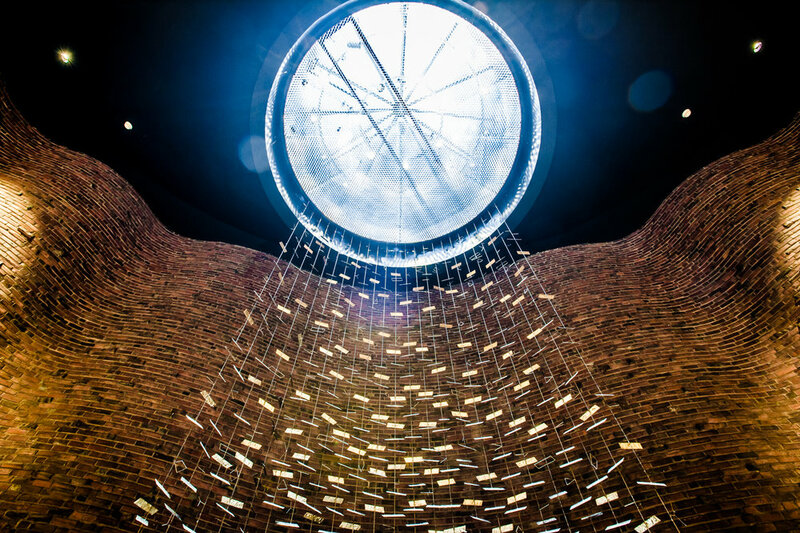 The sanctuary itself has just one window, a domed skylight, through which light spills onto an altar, platform and metal screen created by mid-century sculptor (and Saarinen friend) Harry Bertoia. The spire and bell tower (with a bell fabricated in the MIT foundry) are the work of Theodore Roszak. 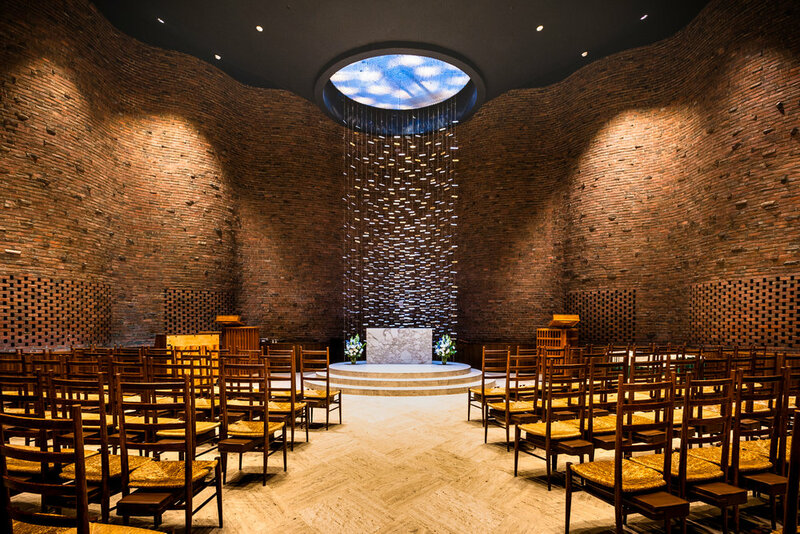 Recently renovated, the MIT chapel is open from 7am to 11pm and hosts gatherings that range from Catholic mass to multiple Protestant services to Shabbat services and small-group or individual meditation. MIT chaplains from a range of backgrounds support student groups in these gatherings.